New pamphlet released in 2017. The 2011 and 2012 editions of Boy Scout Requirements had different text for requirement 9 than the new merit badge pamphlet. That discrepancy has now been corrected. Explain to your counselor the most likely hazards you may encounter while participating in astronomy activities, and what you should do to anticipate, help prevent, mitigate, and respond to these hazards. Explain first aid for injuries or illnesses such as heat and cold reactions, dehydration, bites and stings, and damage to your eyes that could occur during observation. Describe the proper clothing and other precautions for safely making observations at night and in cold weather. Then explain how to safely observe the Sun, objects near the Sun, and the Moon. Explain why binoculars and telescopes are important astronomical tools. Demonstrate or explain how these tools are used. Describe the similarities and differences of several types of astronomical telescopes, including at least one that observes light beyond the visible part of the spectrum (i.e., radio, X-ray, ultraviolet, or infrared). 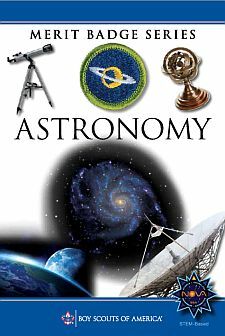 Explain the purposes of at least three instruments used with astronomical telescopes. Describe the proper care and storage of telescopes and binoculars both at home and in the field. Identify in the sky at least 10 constellations, at least four of which are in the zodiac. Identify in the sky at least eight conspicuous stars, five of which are of magnitude 1 or brighter. Make two sketches of the Big Dipper. In one sketch, show the Big Dipper's orientation in the early evening sky. In another sketch, show its position several hours later. In both sketches, show the North Star and the horizon. Record the date and time each sketch was made. Explain what we see when we look at the Milky Way. List the names of the five most visible planets. Explain which ones can appear in phases similar to lunar phases and which ones cannot, and explain why. Using the Internet (with your parent's permission), books, and other resources, find out when each of the five most visible planets that you identified in requirement 5a will be observable in the evening sky during the next 12 months, then compile this information in the form of a chart or table. Describe the motion of the planets across the sky. Observe a planet and describe what you saw. Sketch the face of the Moon and indicate at least five seas and five craters. Label these landmarks. Sketch the phase and the position of the Moon at the same hour and place, for four nights within a one week period. Include landmarks on the horizon such as hills, trees, and buildings. Explain the changes you observe. List the factors that keep the Moon in orbit around Earth. With the aid of diagrams, explain the relative positions of the Sun, Earth, and the Moon at the times of lunar and solar eclipses, and at the times of new, first-quarter, full, and last-quarter phases of the Moon. Describe the composition of the Sun, its relationship to other stars, and some effects of its radiation on Earth's weather and communications. Define sunspots and describe some of the effects they may have on solar radiation. Identify at least one red star, one blue star, and one yellow star (other than the Sun). Explain the meaning of these colors. Plan and host a star party for your Scout troop or other group such as your class at school. Use binoculars or a telescope to show and explain celestial objects to the group. Help an astronomy club in your community hold a star party that is open to the public. Personally take a series of photographs or digital images of the movement of the Moon, a planet, an asteroid , meteor, or a comet. In your visual display, label each image and include the date and time it was taken. Show all positions on a star chart or map. Show your display at school or at a troop meeting. Explain the changes you observed. *If instruction is done in a planetarium, Scouts must still identify the required stars and constellations under the natural night sky. **To complete this requirement, you may use the Scout Planning Worksheet at http://troopleader.org/wp-content/uploads/2016/03/512-505_16_Wksht_WEB.pdf.